Shelli Dawdy is first and foremost the mother of three children whom she has taught at home via the classical method since removing her children from school in 2001. During her early years as a homeschool mother, she worked part-time as a freelance writer. Born and raised in the Iowa, Shelli and her husband moved to the state of South Dakota in 1997, attracted to its more limited government and friendly tax environment. In 2006, Shelli and her family relocated to Lincoln, Nebraska, when her husband’s employer offered a new position. She took a break from work and politics for a time, recognizing the need to focus solely on her childrens’ schooling with two now of high school age. Distressed by many things she was witnessing on the national political scene and disillusioned about the Republican Party, she decided to start writing again, this time online. Motivated to get involved with others at the grassroots level, she networked with activists on the social media tool, Twitter. She was involved in organizing the first tea party rallies inspired by Rick Santelli’s “rant” on CNBC in February 2009. Recognizing that activism should generate on the local level, she founded Grassroots in Nebraska in March of 2009. The group’s mission is a return to Constitutional, limited government, according to its original meaning. While the group has held several tea party rallies, it’s focus is to take effective action. 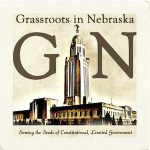 Among its many projects, GiN successfully coordinated testimony for the hearing of the Nebraska Sovereignty Resolution, networked with other groups to ensure a large show of public support at the hearing, and coordinated follow up support to ensure its passage in April 2010. Are Nebraskans Giving In On ObamaCare? If so, why?! This article Are Nebraskans Giving In On ObamaCare? If so, why?! appeared first on Grassroots in Nebraska. I am in receipt of your recent Chairman’s Report update, and would like to report an injury; I have some bruising of the chin area, sustained when my jaw hit the floor from incredulity. This from the state Republican Party chairman whose senators own a super majority in the legislature, the same legislature that is about to pass without serious debate, challenge, or objection, a huge increase in the Nebraska Medicaid entitlement program? This article NEGOP: Help us understand how you differ from Democrats appeared first on Grassroots in Nebraska. This article The Myth of Nebraska’s Sovereignty Resolution (10th Amendment) appeared first on Grassroots in Nebraska. In the week and a half before the election, we gave two presentations about Proposed Amendments No. 3 and 4 on the Nebraska ballot, which would have extended the term limits for Nebraska State Senators Nebraskans voted into the State Constitution in 2000 and would have increased their salaries from $12,000 to $22,500 per year. We decided to focus on those two Amendments because we knew, based on our research and direct experiences, that our State Legislators consistently seek very wrong solutions to some big problems in our Unicameral. We focus on just one of those problems here which just keeps rearing its ugly head. Just a brief article to provide links so people may examine results of the election in Nebraska in more detail. I humbly suggest that among the motivations one could glean from Tuesday’s election results, would be to turn more of our attention to the happenings within in our own state. For one thing – WHY are there so MANY government bodies on our ballots necessitating all of these candidates? Do we really need all of these entities and all of these people?